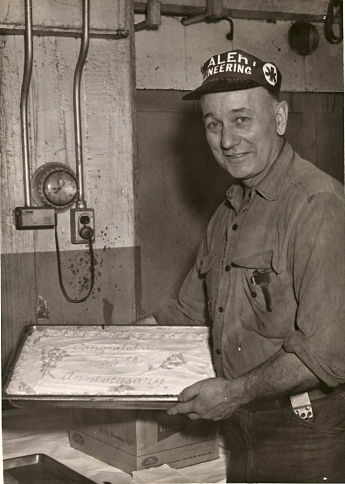 Oscar D. Aderman celebrating his 35th anniversary working at Kimberly-Clark in Niagara, Wisconsin. The families of Carl and Floy (Bates) Aderman and Martin, Jr. and Katherine (Storck) Boerner came together in Niagara, WI. Niagara is on the Menominee River which helps create the border between Wisconsin and the upper peninsula of Michigan. Carl and his oldest son, Oscar, worked at the Kimberly Clark paper mill during the winter months and boarded at Martin’s house behind the mill (his wife, Katherine, had died before this). It was here that Oscar met Martin’s daughter, Anna, his wife-to-be. Eventually, they bought the house from Martin and asked him to continue living with them as they raised their family. Carol D. Miller, a professor at the University of Wisconsin-LaCrosse and a native of northeastern Wisconsin, wrote a book entitled Niagara Falling. In it, she considers the affects of a large company that cares for (even if paternally) a small community, helps it thrive, and then has to leave the community as a result of the massive economic shifts taking place in the 21st century. She begins her book with a good overview of the best of what Kimberly-Clark brought to the village when it built a paper mill there. The community of Niagara did not exist until Kimberly-Clark took interest in the region. The story goes that in 1889 John Stoveken built a small pulp mill next to what was known as Quinnesec Falls on the Wisconsin side of the Menominee River. The settlement that formed around the mill was merely a lumber company, blacksmith shop and a store. As late as 1897, there were only two frame houses in the area.
. . . Legend has, “On a bitter cold day in the following February  a bobsled load of Neenah executives drove down the river from the railroad and closed the deal.” Quickly, they tore down the small operation that existed and installed power equipment and built a new mill with two new paper machines that produced fifty tons of water-finish wrapping paper per day. . . . They also renamed the town “Niagara,” obviously because of its resemblance to Niagara Falls, New York.
. . . In addition to housing, Kimberly-Clark built the Niagara Community Club in 1917. The clubhouse contained a soda fountain, ice cream parlor, pool room, shower and locker rooms, bowling alleys, a gymnasium and theater, a library and other rooms they rented to the Masonic Lodge. . . . Membership in the club cost $2.00 per year. By 1923, the clubhouse had an adjoining outside swimming pool. The motivation for this pool was to prevent drowning deaths caused by children swimming in the Menominee River. Throughout its tenure as owner of the mill in Niagara, Kimberly-Clark was the backbone of the community. . . . This came to an end in the 1970s when the current massive economic changes began. Niagara has since struggled as a community, but it enjoyed almost a century of a great economy and employment. It was during this century that Oscar and Anna (Boerner) Aderman raised their sons in Niagara and enjoyed their retirement. 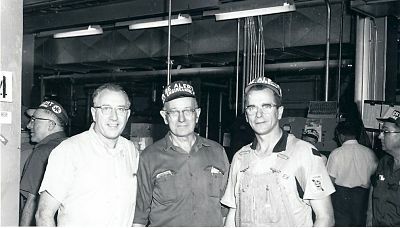 Brothers Edgar, Oscar, and Edwin Aderman worked at Kimberly-Clark throughout their adult lives. 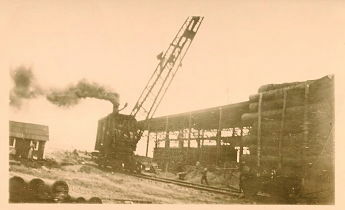 A steam crane moving logs behind the Kimberly-Clark mill in Niagara, WI. 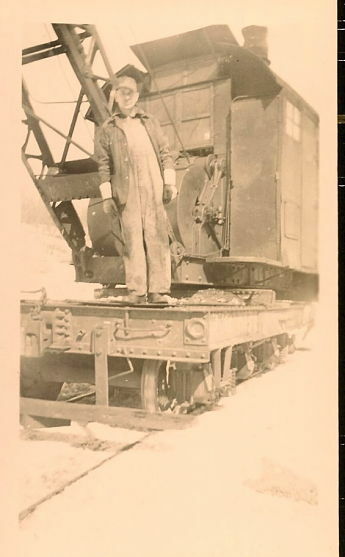 Oscar D. Aderman on a steam crane.